I remain fascinated by Bonewits’s analysis, and I believe there is some truth in it — truth in what it reveals of how people think why they try to influence the world around them, leaving aside any question of whether such influences are effective. I’m not going to give you a book report here. 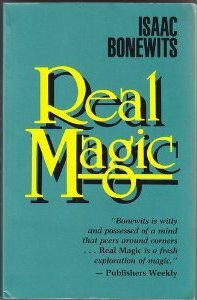 Real Magic is worth reading. Amazon’s reviews give good warnings about its flaws. There’s an e-book edition too, if your tastes swing that way. A lot of how I think about the supernatural descends from the style — of not the content — of Bonewits’s analysis. Systems of human belief are based on human stories, subject to narrative logic and the occasional mutations that happen with copy errors, written and oral and … other, accidental and deliberate, but it’s a fact that the billions of humans that survive now are derived from a handful of families who would have all started with the same stories that can be tracked, etymologically, in much the same way that mitochondrial DNA can be tracked to prove the pinch-points in our own descent. Story — motif, the language in which it is told, common elements with different tales, key rhythms, and telltale word choices, and blurred euphemisms as the narrative dances around historical taboos, the stories themselves that we carry around and use to judge the justice of the universe — dictates what we believe and provides a different kind of causal logic than what we find in the laboratory. It’s a narrative logic that assumes different rules than the laws of physics. Our shared narrative logic assumes a persistence of a spiritual echo of any physical being or object that is destroyed, especially if it is destroyed before it would have naturally occurred, by human action. Narrative logic assumes human action to be separate from and outside of some ideal natural plan, and is judged good or evil based on how closely willful action aligns with that plan. Narrative logic assumes that objects that have been in contact have mixed in such a way as to maintain that contact, or a ghost of that contact, after the objects have separated. For examples off the top of my head. These alternate causal elements seem so natural to us that it takes the introduction of a completely different set to give these a background high enough in contrast that they can be seen. Short stories like “Biographical Notes to ‘A Discourse on the Nature of Causality, with Air-Planes’, by Benjamin Rosenbaum” by (of course) Benjamin Rosenbaum and “Tlön, Uqbar, Orbis Tertius” by Jorge Luis Borges pry our fingers loose a tad on the narrative logics we’ve carried like blankies from our early childhood by showing us that the warp and woof of experience can be woven into entirely different textures if we feel like it, and both do a fine job of providing that background contrast to show how unnatural our natural assumptions truly are. I leave it for now as an exercise for the reader to try to build a complete list of narrative logics that are effective elements of causality in our oldest stories but not, necessarily, in a physics lab. Because those elements are the ones we try to use to change the world around us when ordinary causality fails us.